A new, charming and cozy home in Saluda River Club’s Woodlands District has just become available for immediate move-in. The 1,938 sq. ft. home located at 127 Downstream Way is designed specifically for first floor living with its master suite on the first floor – clearly, this home is built for ease and comfort in a private natural setting near the glorious Saluda River. 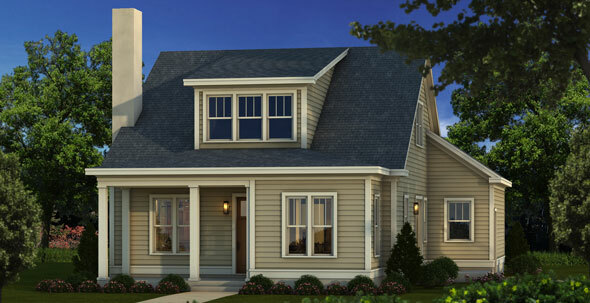 The well-crafted 2 bed, 2.5 bath home features a two-car garage and a loft and is priced at $369,391. Entering from the covered front porch, discerning buyers will appreciate the 9’smooth ceilings, stunning hard­wood floors, and custom moldings. To maximize the home’s inviting entertainment space, the only separation between the main living areas is the detail work on the ceilings. The welcoming family room features a gas fireplace with a decorative mantle and large double window overlooking the outside living area. This brand-new home has a lot to offer in addition to a great location near Columbia, in Lexington’s District One School District. Check out these handsome features – and don’t forget the great amenities offered to the residents at Saluda River Club. The generous kitchen features luxury stainless steel appliances including a gas cooktop, a granite-topped island that seats four, pantry, and plenty of custom cabinets. It is open to both the family room and the café, a casual area to enjoy breakfast or a quick cup of coffee with friends. The café features plenty of windows to bring the peaceful, quiet outdoors in. The luxurious master bedroom features two walk-in closets and a door separating the bedroom from the bathroom for privacy. The gleaming master bath is designed with a private water closet, separate vanities, large tile shower, and linen closet. Also on the main floor, the bright and airy laundry room features a convenient workspace as well as a window overlooking the side porch. Upstairs buyers will find an additional bedroom with large walk in closet, private bath, loft, and walk-in attic space for storage. To learn more about this home and others currently available at Saluda River Club, please schedule a visit soon. For more information or directions, please call 803-358-3969 or visit www.saludariverclub.com.